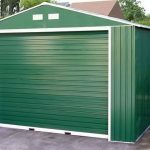 Metal sheds have a lot of benefits when compared to wooden sheds, particularly as they don’t require annual treatments and don’t suffer from rot, cracks, or splits. 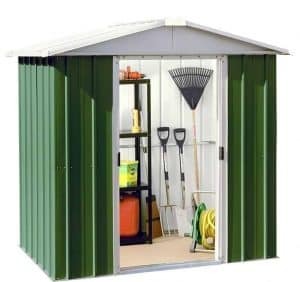 If you’ve not had one before, then this is a great choice as your first metal shed. 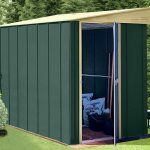 One of the first things that struck us when reviewing this shed was its appearance, with the dark green painted finish meaning that it won’t look out of place in any garden. One other benefit of metal sheds is their excellent water resistant properties, and this is particularly applicable to this shed. The apex roof at its summit means that water is channelled away from the interior of the shed, and further protection is provided by the galvanised cladding. It’s used on the floor and gables as well as the walls, which is why a 12 year warranty against perforations caused by rust is offered. We particularly liked the fact that an anchor kit is supplied as standard, as is a floor support kit. This means that the shed owner can decide whether they want to have a concrete floor or a wooden floor, although the timber boarding for a wooden floor will need to be purchased separately. It didn’t take long for us to appreciate the high quality finishing that characterises this shed. The dark green and dark green paint scheme is included inside and out, and this itself adds an extra protective coat which will help to keep the contents in the shed dry. 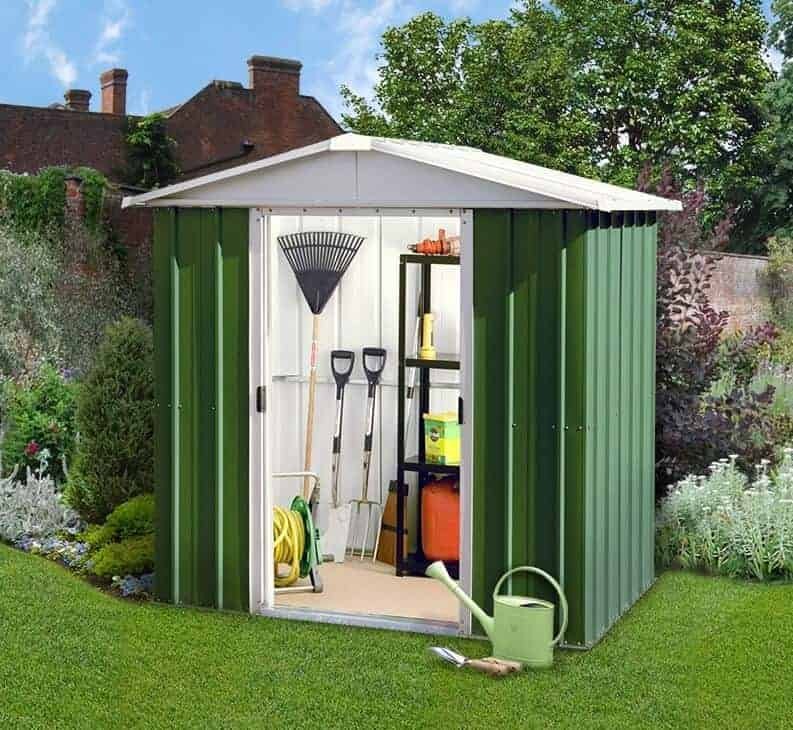 It’s just one reason why this shed will be a good selection by people who are looking to improve their storage facilities without taking up too much room in their garden or patio. 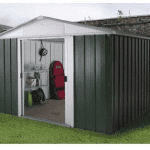 The apex roof also helps to improve the shed’s water resistance, but it’s especially helpful in a shed of this size. At its peak the shed is 1.89m high, but the eaves height is 1.58m. This was very noticeable when we were inside, but the width and depth of the shed were accommodating at 2.02m and 1.97m respectively. This means that there is lots of room for a lawn mower and garden tools, and thanks to the wide doors it could even be used for larger machinery and equipment. We were very impressed by the cladding, as it gave a strong and stable finish while still being lightweight in nature. This makes it very easy to assemble, while still being durable when assembled. The 0.35mm cladding is made up of steel that has then been galvanised to give a zinc finish, and we were glad to see that this had been used across the whole of the shed, including the roof. The metal floor support kit was a very welcome extra. We found it very easy to put together and it then creates a supportive frame on which a timber floor can be placed. This keeps the floor above the ground itself, which is a very important factor in stopping rot formation due to rising moisture. 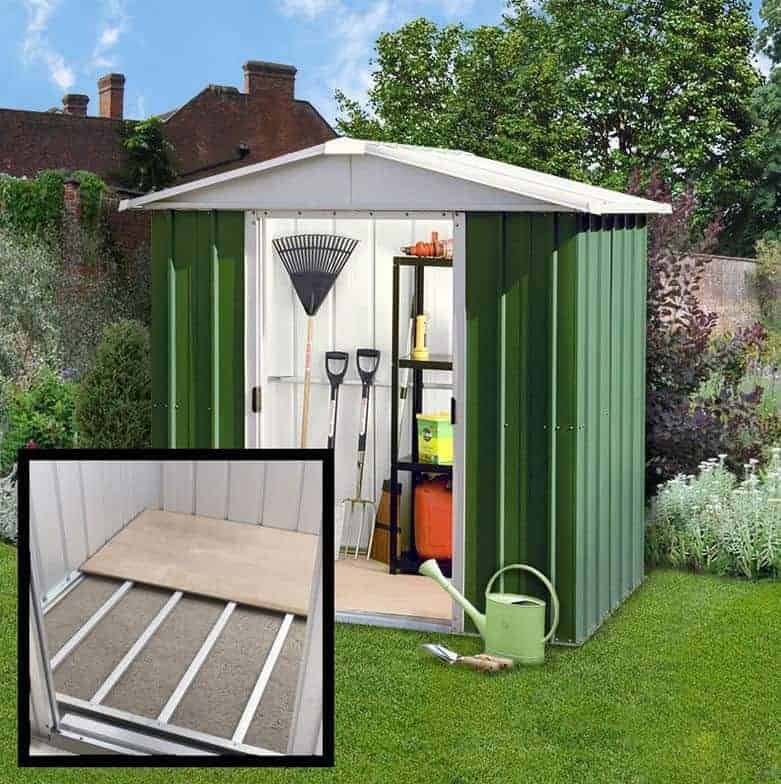 Many people prefer a wooden floor, even in a metal shed, as it gives extra warmth and has a traditional appeal, so it was good to see that this kit facilitates the installation of one. Because of the tough and weather resistant properties of metal, we always expect a long warranty to be included, but the manufacturer here has surpassed our expectations by providing a 12 year guarantee against perforations resulting from rust. As always, no treatment is required to keep the warranty valid, other than cleaning the metal down from time to time. Sliding doors can sometimes seem a little flimsy, and therefore provide a potential weak spot from a security point of view, so it was good to see that this was negated by the internal fitting of these doors. We found that the doors moved easily and smoothly, and were impressed by the wide opening of 0.79m, if not by the height of the doors at just 1.58m. There are no windows, but as the doors are centrally positioned there is a good influx of natural light when the doors are opened. 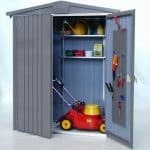 Although designed for storage purposes, we wouldn’t recommend this as a security shed due to the relative thinness of the cladding used. With the addition of a padlock, however, this can still be a good choice for storing standard garden tools and equipment, particularly as the window free design stops people from looking inside as they pass by. The handles are padlock ready, although no padlock is included. 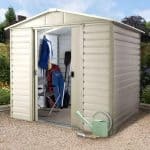 We liked the fact that both a resin shelving unit, complete with four shelves, and a portable toolkit are available as optional extras, as this allows the owner to make the most of the storage space offered by their shed. Another option that many people will opt to buy is wooden flooring to make the most of the floor support kit. This isn’t available directly from the manufacturer but decking boards are widely available, and make an excellent choice for this purpose as they are hard wearing and moisture resistant. The timber used will need to be treated with preservative on a yearly basis, but the supporting frame makes the removal and installation of the boards a simple process. We could tell that this shed was manufactured to a high quality from the moment it was assembled. High quality galvanised steel has been used throughout, and even the screws supplied in the anchor kit are rust proof. The 12 year warranty against perforations caused by rust was very welcome, and shows just how effective the cladding is, particularly in conjunction with the apex roof. The double doors helped us to make the most out of the storage space that was available, but a taller structure would have substantially improved the capacity. Everything is included that’s needed for the installation, and the instructions were easy to follow and not too complicated. If you have a friend to help with the installation process, expect it to take four to six hours. 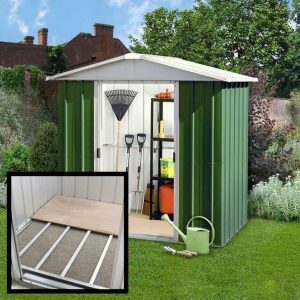 If you wish to have a timber floor in your shed then this represents very good value, even though the timber for the floor will need to be purchased additionally. 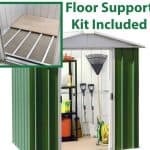 If a timber floor isn’t a priority, however, the shed can be purchased more cheaply without the floor support kit. Final Thoughts: We liked both the look of this shed, which should make it appeal to those who usually prefer the traditional look of a wooden shed, and the quality of components used within it. The 12 year warranty isn’t only a value adding feature, it also shows that Yardmaster have confidence in their shed’s performance and longevity. 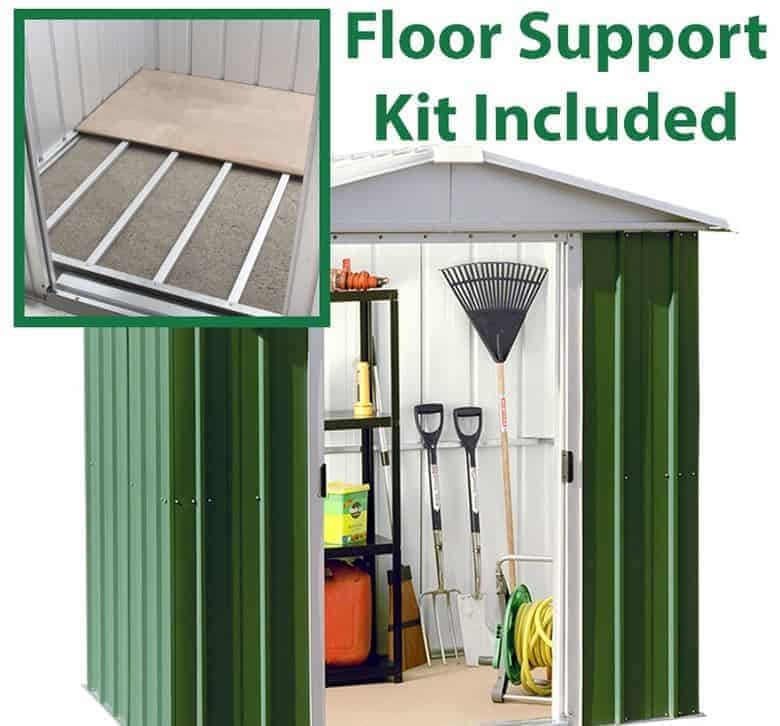 It was good to see that a floor support kit was included, which is unusual for a metal shed costing less than three hundred pounds, and a full anchor kit is also supplied if you want to save time by screwing the shed into a pre-existing concrete floor.